The Fillrite FR1118A10 is an in-line digital flow meter with a flow rate of 28 gallons per minute. The mechanical flow meter is produced in the U.S. with the seal of approval "UL" (Underwriters Laboratories) and EC (European Community). The body shell is made from aluminum, with the measurement chamber polyurethane highly resistant and non deformable. Features 2% margin of error accuracy. Benchmarking can be measured by calibratrion screw. 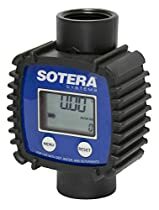 This meter has a 1 inch internal thread input and output, and is a tilting disc type. It has a maximum pressure rating of 145 psi. Can also be used by gravity or coupled pumps. Only use with diesel and kerosene. 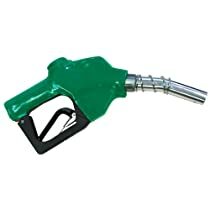 DO NOT USE with gasoline, water, Diesel Exhaust Fluid (DEF), and chemical fluids. DO NOT USE with gasoline, water, Diesel Exhaust Fluid (DEF), and chemical fluids. Bought this for gravity gasoline tank. in the description it does say for gasoline but when the product arrived it clearly says for use only with diseal and kerosene. DO NOT USE with gasoline, water, diesel ??? Pretty disappointing to see it made out of the same composite material that a hammer from (China) is made with.. I had no idea this was not made in the US/ had me fooled with the brand name.